Explore remote fishing villages to experience the daily lives of the locals, ancient caves and grottos, kayaking and swimming. Join in authentic cooking demonstrations of Vietnamese cuisine or sit back and enjoy the creature comforts and amenities aboard the stylish Stellar Cruise. 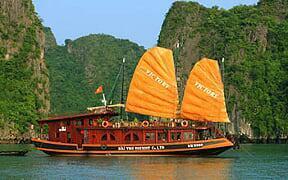 This tour is a great suggestion for travelers who do not wish to just have another ordinary trip on Halong Bay. - Arriving Tuan Chau marina. Welcome aboard Carina Cruise. Meet the captain, crew and join us for welcome cocktail as we tell you about life onboard. Ha Long Bay Cruise on Stellar Our tour guide for our Ha Long Cruise and is fluent in English. The staffs and crew were friendly. Bed is comfortable and food is good! Would highly recommend this tour with AClass Stellar cruise. Had an amazing time on The AClass Stellar cruise. The staff was exceptional and our tour guide was amazing. 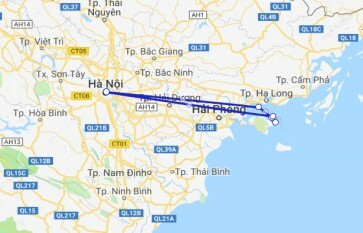 He gave use a brief history of Vietnam as well as a spot on descriptions of the tourists sites we went to. He was very knowledgeable and extremely friendly. Always had a smile on his face and easy to understand. 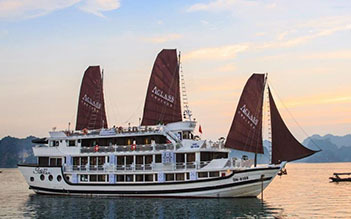 I would highly recommend this cruise and it’s staff to anyone who is looking to go to Ha long Bay. The boat was comfortable and the food was fabulous. Wonderful stay at the Aclass boat with the best host Luca My girlfriend and I had a wonderful time at the Aclass Stellar Cruise. Besides the wonderful view of Ha Long Bay, the team under charge of Luca was great. Thanks for being a good host! My two friends and I spent 2 nights on the Stellar boat and had an incredible experience. We were picked up around noon from the dock by Tom "Cruise" and met Tony and rest of the fantastic crew. The rooms were very clean, the food was tasty and filling (the chefs went out of their way to take care of those with special dietary needs), and the drinks well made. During the trip we: -Explored and swam in the beautiful Halong Bay -Saw a floating village -Went squid fishing (though no luck) -Enjoyed the sunset party -Saw the sunrise and did tai chi on the upper deck in the morning -Watched a magic show by the charming Tony every night -Saw the full moon and stars over the bay -Visited a pearl farm -Saw limestone caves Our favorite part however was kayaking out to a beautiful secluded lagoon through some sea caves, to enjoy a peaceful moment of zen while listening to the sounds of waves and birds. Sitting at the front of the boat with our feet dangling as we glided across the ocean in the warm sun will forever be with us. We would highly recommend this cruise to families, backpackers, and groups alike, as the crew took great care of everyone!